" I have a GoPro Hero 4. While connected to my Mac via a USB digital cable, it automatically copied the files to a folder with today’s date as the name. However, after then, I found there isn’t a video at all, the folder is 0 byte, without any file. The worst thing is that after the copy, the actual video was deleted instantly. Is there a way for GoPro Hero 4 to recover deleted files from gopro? Please help me! " 1. The SD card is formatted accidentally, deleting all videos and photos stored there. 2. Without a firm connection, the videos and photos just lost during the transfer. 3. Somebody accidentally deleted the files on GoPro. 4. You kid deleted the GoPro files intentionally. 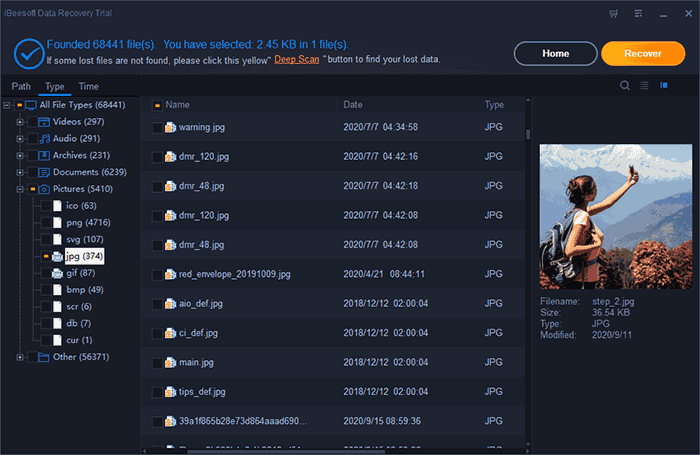 No matter in what reason that cause the file deletion from your GoPro camera, there is a chance for you to recover deleted GoPro files if you perform the GoPro file recovery right and in time. Here in the following, I’m going to tell you how to recover deleted files from GoPro. Please check it out. First things first, do not do any further operation with your GoPro after you find some files are deleted. All deleted files from the SD card in GoPro camera are still there, but invisible and waiting to be overwritten by new data. Any further operation on the GoPro will create new data and make the deleted files deleted permanently. I strongly suggest you get the SD card from GoPro before you have successfully recovering the deleted files from GoPro. Next, you should download and install the latest iBeesoft Data Recovery, either the Windows or Mac version for your computer. 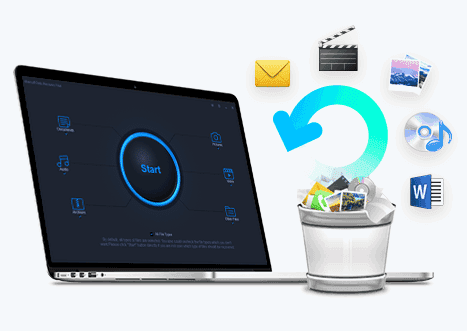 It is a professional yet easy-to-use file recovery software which is developed for people to recover deleted files from GoPro, hard disk, USB drive, SD card, external hard drive and more. It is one of the choices to recover deleted GoPro files on Mac or Windows PC. It supports videos and photos in almost any format, including MP4, FLV, MOV, MPEG, JPG, PNG, GIF, etc. just every file type you used daily. The GoPro file recovery software is compatible with all kinds of SD cards you used for GoPro. It is free for you to recover up to 200MB files from GoPro camera. How to Recover Deleted Files from GoPro with GoPro File Recovery Software. Use a USB cable to connect GoPro with your computer. If you have removed the SD card from the GoPro camera, you need to use a card reader to connect it with your computer. When connected successfully, it should appear on your Mac or Windows PC as an external hard drive. iBeesoft Data Recovery has both Winsows and Mac versions for you to choose. Please choose the right version according to your computer operating system. Download and install the right version on your computer. It is fully compatible with the latest Windows 10 and macOS 10.14. Launch the GoPro file recovery software and uncheck the unwanted file types. 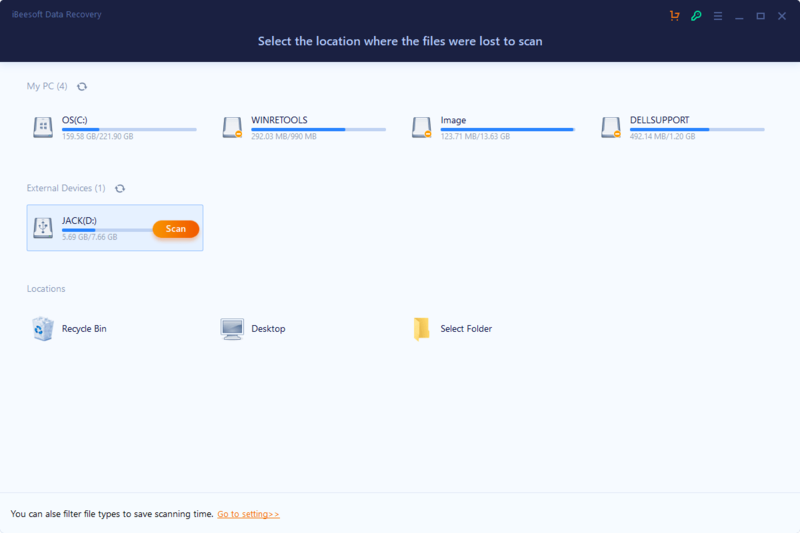 By default, all file types supported are checked, being prepare for the scanning. You just need to keep the file types for GoPro you want to recover and click "Start" to recover deleted GoPro files. In the next step, you’re supposed to choose the GoPro or GoPro SD card to scan. It is listed in the window with other hard drive listed. Select it and click "Scan" to recover deleted files from GoPro. It only takes a few minutes for the software to scan your GoPro or GoPro SD card for the deleted files, including videos and pictures. When it finished, you can filter out the files by choosing the file type and file extension on the left side. Next, preview the files and click "Recover" to save them on your computer. Please don’t save the recovered deleted GoPro files to GoPro or GoPro SD card again. They may get lost again.